EMC has agreed to acquire DSSD, a Silicon Valley startup developing technology for pooling server-based flash for high-performance data access. The company will help EMC to tackle challenges in making flash capacity on servers into shared storage capacity. Its chairman is Andy Bechtolsheim, a pioneer of networked computing from Sun Microsystems and numerous startups. 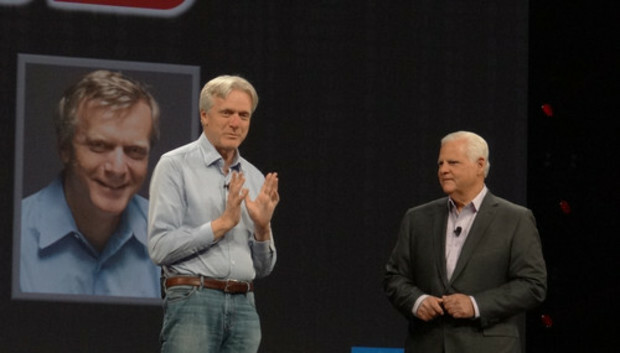 Its CEO, former 3Par executive Bill Moore, will continue to run the DSSD business inside EMC, while Bechtolsheim remains an adviser. Server-based flash offers rapid access to data because it's connected to servers via fast PCIe connections. But it's limited to 10TB or less on each server and is hard to manage, forcing companies to rewrite applications just to use it, said Jeremy Burton, EMC's president of products and marketing, who announced the acquisition at EMC World in Las Vegas. There's little public information about DSSD even though it's been around for four years, developing a product in stealth mode that EMC expects to have on the market next year. It's not at all clear what that product will look like, but EMC has some idea what it will do: The target applications are said to include in-memory databases such as SAP's HANA; real-time analytics, especially using Hadoop; and the most data-intensive workloads in government and science, such as climate modeling, face recognition and genomics. EMC introduced its performance-boosting XtremIO all-flash array last year, but the DSSD product is expected to complement that platform, residing at the server tier rather than the storage tier. Though flash speeds up data access everywhere when compared with spinning disks, getting the ultimate speed requires putting it as close as possible to where the computing takes place. Any distance the bits have to travel over a network introduces delays. That's the idea behind HANA and other in-memory databases, which help enterprises make the best use of their big data to better run their businesses. Part of EMC's motivation for the purchase may have been Silicon Valley star power, said Pund-IT analyst Charles King. In addition to Bechtolsheim's fame as a founder of Sun and a key player at Cisco, Arista Networks and other companies, several members of the management team at DSSD were key to the development of Sun's ZFS high-performance file system. EMC spends about 12 percent of its revenue on R&D -- about US$3 billion this year -- and 10 percent on acquisitions, Chairman and CEO Joe Tucci said in his keynote address Monday. It's focused on helping enterprises advance from what it calls the "2nd Platform" -- essentially client-server computing -- to the "3rd Platform" of cloud, mobile, big data and social networking, he said. EMC was an early investor in DSSD. It expects the acquisition to close in the second quarter.